Stops are located throughout Dublin Airport and Dublin City. Monday - Friday: 5:45am - 12:30am. Saturday: 6am - 12:30am. Sunday: 7am - 12:30am. Departures every 10-15 minutes. Monday - Saturday: 4:45am - 11:30pm. Sunday: 6:30am - 11:30pm. Departures every 10-15 minutes. Monday - Saturday: 5am - 12:25am. Sunday: 7:25am - 12:15am. Departures every 30 minutes. Found it easy from airport and comfortable ride to our destination, very reliable and efficient.Helpful at customer service too. 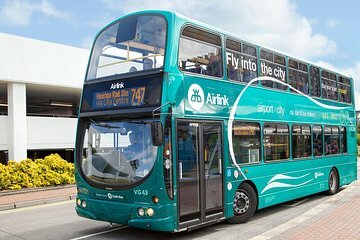 We took Airlink Express from the airport to Dublin center and then back again after one wonderful week. The bus was easy and comfortable and excellent choice, I warmly recommend!